Laminated TZ Tape features standard adhesive that is designed for flat surfaces like office paper, file folders and binders. Resists water, grease or grime. Use in hot and cold environments as well as outdoors (water-resistant). 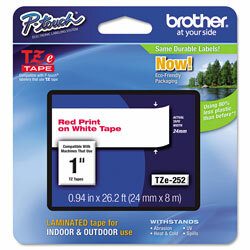 Use with Brother PT-330, 350, 520, 530, 540, 550, 580C, 1400, 1500PC, 1600, 1650, 2200, 2210, 2300, 2310, 2400, 2410, 2430PC, 2500PC, 2600, 2610, 2700, 2710, 3600, 9200DX, 9200PC, 9400, 9500PC and 9600. Cartridge yields 26.2'. White Label Maker Tapes and Ribbons from Brother! 342 In Stock today.